It’s another snowy day in Boston. It is not yet a day where school and work has been canceled, but it’s beginning to look as though it could turn into one. We had a true snow day last week. We, and like three-quarters of this country. I heard somewhere that one day last week, every single state in the United States had snow (even Hawaii!) on the ground. Well, except Florida. That troublemaker. Waking up to a snow day, the edges of the world taken off by the softness of the white, the stillness that hangs in the air, the celebratory confetti of fluffy flakes, always fills me with the giddiness of a child who knows instantly – without having to check the television or radio reports – that she does not have to go anywhere today. She can stay home and play in the growing drifts. Watching the snow falling always makes me think of grace. Grace, cascading down to cover the world, making it look clean and new, reminding us of how marvelously beautiful it is. It’s something we need so very much. Of course, I suppose I would have a hard time selling this notion to the commuters stuck in traffic, or in snowbanks. And isn’t that just so like us, to take grace and instead of just accepting it, letting it be a gift, we want it to be what we want. We try to drive around in it, plow it and salt it to conform to our paths. And then we’re surprised or annoyed when we start fishtailing around or spinning our wheels. Instead of frolicking in it, or sliding on it, or letting it gently stick to our eyelashes and melt on our noses. Or simply watching it while drinking hot chocolate and sharing a warming meal. Salad may not seem like the most congruous meal to prepare on a snow day. But, it’s what I chose to make, and it was quite perfect. This isn’t your standard salad though, it’s a salad with substance and personality. It is based on the traditional Italian bread salad, Panzanella, which is normally packed with tomatoes and basil and oozes summer sunshine. Instead, I tossed the bread with hearty, roasted winter vegetables whose caramelized sweetness and earthy textures whispered soothing stories of hibernation and the calm of the dark soil under the snowdrifts. I toasted cubes of a crusty, chewy sourdough on the stove top, with plenty of olive oil, until they were golden and crisp. These added a wonderfully, toothsome chewiness. And finally, to round the salad out and make it a satisfying lunch, I tossed in smoked Mozarella, which added just a touch of sultry smokiness. Then we sat and ate it, happily watching the snow just keep coming thickly down. Preheat your oven to 425F. Toss the beet cubes with a small amount of olive oil and a sprinkling of salt and pepper. Spread them in a baking pan and pop them into the oven. Roast until just for tender, about 40 minutes. 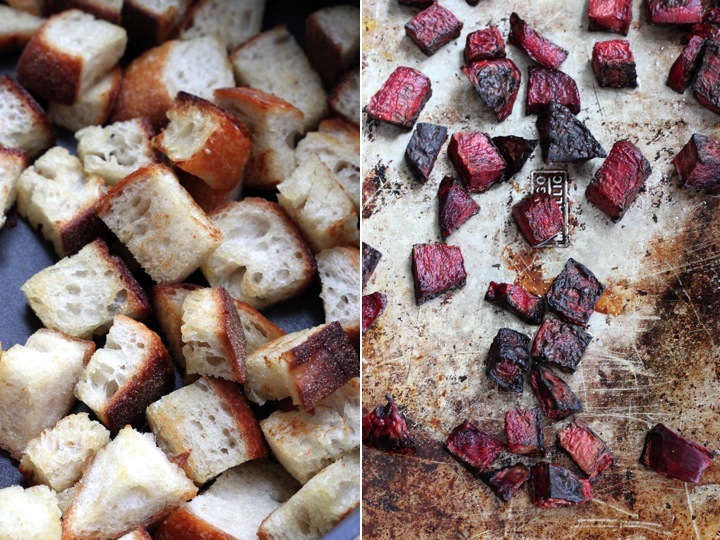 In the meantime, toss the butternut cubes with a bit of olive oil, salt and pepper, spread them in another baking pan and roast alongside the beets until tender, but not about to fall apart. About 20-25 minutes. Take the butternut squash and the beets out of the oven as they are finished and set aside to allow them to cool for a while. In a very large sautee pan, heat about 2 Tbs. olive oil over high heat until shimmering. Toss in the bread cubes and toss them around. Cook, tossing frequently, until they become golden browned, 10ish minutes. Take off the heat and set aside. At this point, slice the kale and the red onion and put them in a large salad bowl. In a small bowl, whisk together all of the dressing ingredients except the olive oil. Then, gradually whisk in the olive oil to emulsify. Pour about half of the dressing in with the kale and onion and toss to coat. 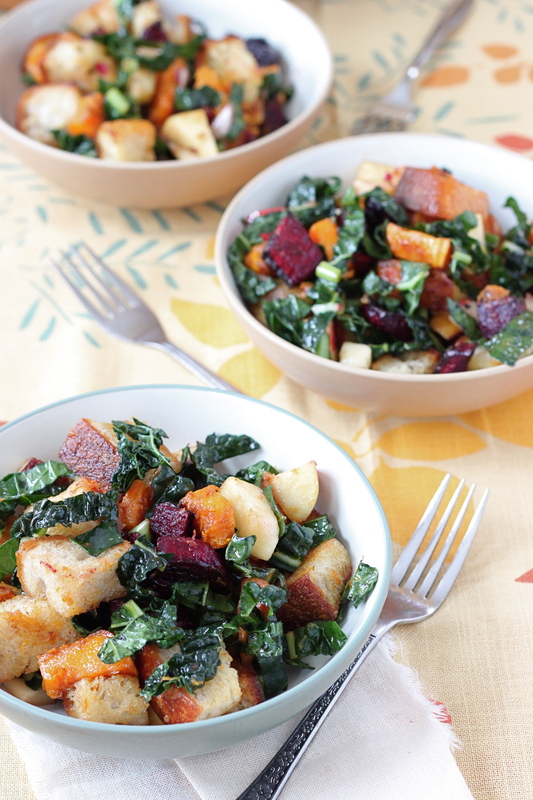 Once the bread, butternut squash, and beets are lightly warm, but not hot toss them with the kale and onion in the bowl. Add the rest of the dressing and toss more. Finally, add the cheese and apple pieces (and a few sliced sage leaves, if you wish) and toss thoroughly until everything is well combined. Serve immediately, or allow to sit for about a half hour at room temperature before serving to allow the bread to soften and the flavors to mingle. This recipe is also part of the Decidedly Healthy or Horridly Decadent blog hop – I’m hazarding a guess that they’re finding it decidedly healthy, though with all its wonderful flavors and textures, I find it a little indulgent too. “Toothsome chewiness”. I love it! Mmm, I bet it would indeed. Gorgeous! That dressing sounds fantastic. Thanks! It’s one of my favorite dressings – I use it on all sorts of salads. This looks like one of the yummiest salads I’ve seen in awhile! You should consider sharing it with a few more folks over at the weekly Saturday Decidedly Healthy or Horridly Decadent blog hop. Looks really good and healthy. 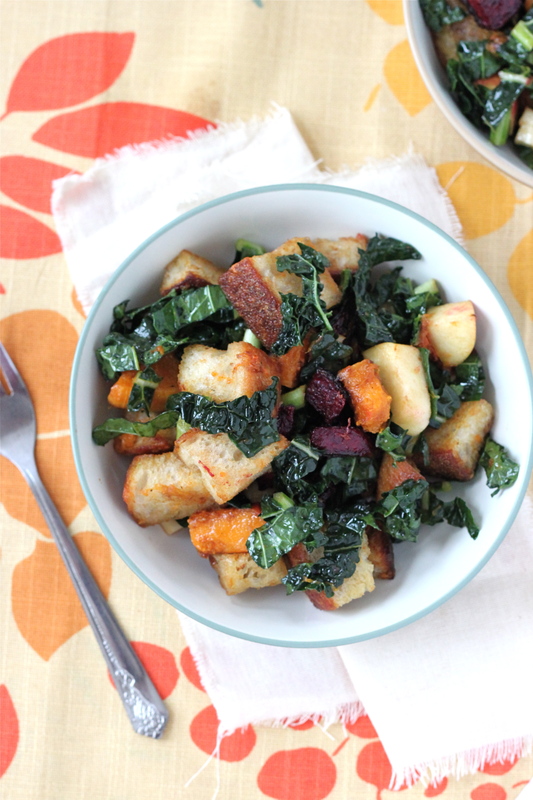 Love the croutons and the kale. I just love a good winter salad and yours looks delicious. I wish I could have it for lunch. Thank you for sharing and you have a great week end! I just love a salad for lunch as well! I hope you get a chance to give it a try sometime – and a really nice thing about this salad is it keeps for up to a couple of days, and doesn’t get all wilty like salads with lettuce do. Made this tonight for dinner, and loved it! Perfect for a chilly December evening. My kids ate it up as its separate components too, so it was a win all around. We just made this last night…it was fab (and used a lot of our CSA veggies)! We used blue cheese and quickly blanched the kale before cutting it (the kale from our share was very tough!). Served it along side roast chicken….yum! Great photos, philosophy, and recipes! 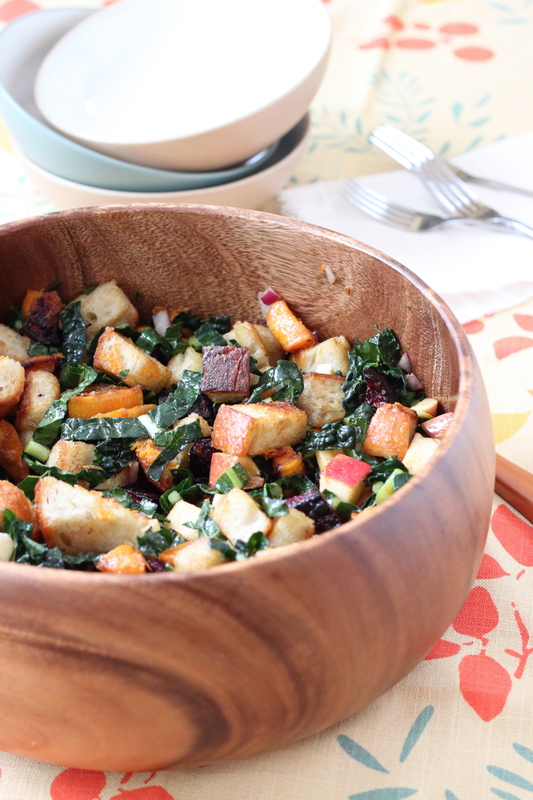 You are currently reading Wintery panzanella with apples and kale at Five And Spice.